Mine: A great movie, but as far as movies that I enjoy it is not in the top. Some great scenes. A the writing is wonderful. It is easy to see why this is considered one the greatest films ever made. My favorite scene is when Kanes friend tells about seeing a woman on the ferry. Chilling stuff. Leonard Maltin/Plot synopsis: Welles' first and best, a film that broke all the rules and invented some new ones, with fascinating story of Hearst-like publisher's rise to power. The cinematography (by Gregg Toland), music score (by Bernard Herrmann), and Oscar-winning screenplay (by Welles and Herman J. Mankiewicz) are all first-rate. A stunning film in every way... and Welles was only 25 when he made it! Incidentally, the reporter with a pipe is Alan Ladd; Arthur O'Connell is another one of the reporters. 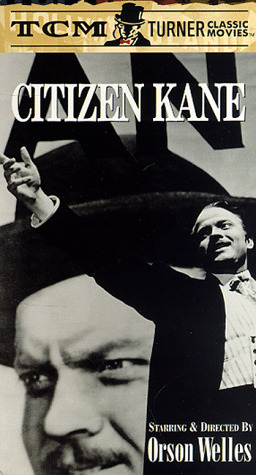 (out of 5 stars) 1941's Citizen Kane Is My Favorite Film, I Like It Because Of Orson Welles Direction, Orson Welles Performance As Charles Foster Kane, Orson Welles And Herman J. Mankiewicz's Screenplay, Gregg Toland's Black-And-White Cinematography, Robert Wise's Editing, Bernard Herrmann's Score And The Storytelling Techniques.